In a day and age where we are always on, always connected and always available, it becomes increasingly impossible to navigate these waters. On the one hand you love your craft, you pour your heart and soul into it. And on the other hand you love those who you do life with and want to make sure they know their value and importance. 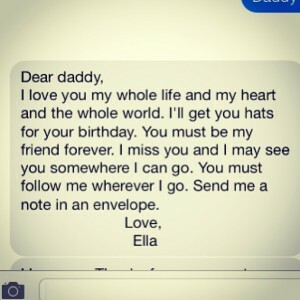 The image above is a text that my wife sent as she wrote down what my daughter wanted to say to me. Just before this, I wrote my wife a text that was for my daughter telling her how special she was and how much she meant to me. I don’t share that picture with you to tell you I am great or something like that but just that this process reminded me how tough it can be to balance our professional life with our personal life. Here are a few tips I have tried to incorporate into my life that help me balance personal and professional. Our phones are a great tool but also can be a great stumbling block when it comes to balancing personal and professional. When are you really off work? If your email lives on your phone then probably never. I would suggest that when the work day end that you turn off your phone. If not then you will constantly checking it. We’ve all seen the family out to dinner where the parents are on their phones and there is no conversation happen. Heck, I am sure that’s been me too. Disconnecting from your phone, twitter, facebook, instagram for a period of time will help you balance things. When you are at your child’s ballgame, are you truly there? Or are you thinking about that problem that needs to be solved at work? Being a developer, I know first hand that problem solving rarely stops when you get up from your desk. Usually there is a problem that lingers in your mind until it is solved and therefore being fully present is tough. The challenge here is to be fully engaged in whatever you are doing. If you are always somewhere else in your mind then you can never fully enjoy the things you are a part of. One tip I received early on in my marriage was that when you get married dating your wife does not stop. Because I want a healthy and great marriage, my wife and I regularly go on dates together. It is a time for us to disconnect from our professional lives and now our children and reconnect. Our marriage is refueled and we are ready to tackle whatever lies ahead. If you have children like me, then dating your kids is a great way to be intentional with them. Not only are you showing them how they should be treated by their future spouses, you are showing them that they are important. Creating these regular appointments will keep you balanced and remind you and others of the important things in life. Growing up, I loved to play baseball and even when I was not playing baseball I was thinking of it. My dad worked for an Insurance company and while his time was limited he always made sure to coach the teams I played on. One lasting image I have in my head is of my dad, dressed in his buttoned up shirt, slacks and dress shoes coaching from the 3rd base box. That image reminds me that while work was important for my dad, I also was important to him. It’s the little things that we remember in life.